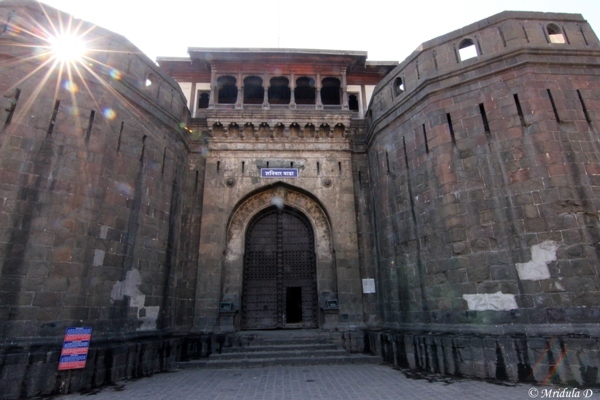 Shaniwar Wada, Pune is said to be the most impressive mansion ever to be built by the Peshwas in the city. 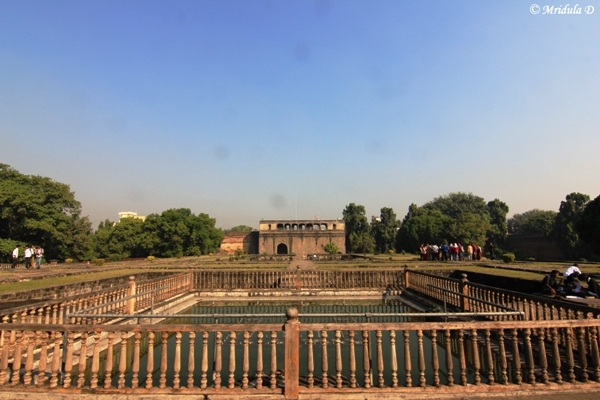 The foundation for the monument was laid down in 1720 by Bajirao I. Today is completely engulfed by the city! We tried to visit it on our first evening in Pune. I was with Dr. Supriya Himanshu of All What She Wants. We were together on the Suryagar trip as well earlier this year. It was good fun to meet her again. The first evening when we reached there, it was already closed. We visited the Lal Mahal instead which is at walking distance from Shaniwar Wada. The current Lal Mahal is not the original one, if you are pressed for time you can easily give it a miss! 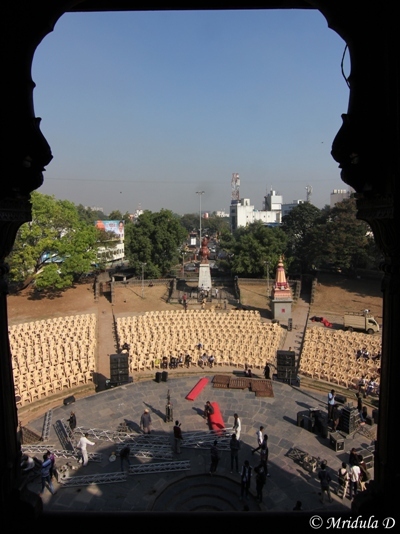 The entrance fee for Shaniwar Wada is Rupees 5 and for Lal Mahal Rs 2 for Indian nationals! 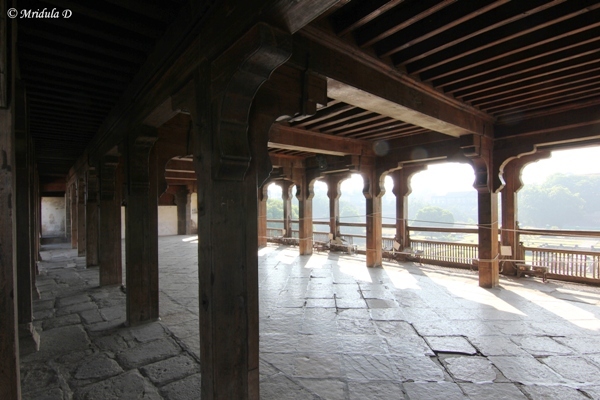 Large parts of the Shaniwar Wada were destroyed in an unexplained fire in 1828. So as of now only the entrance and the grounds remain. Still it is a nice place to visit, particularly if you like ruins and history. We visited it on a week day, hence it was not too crowded. 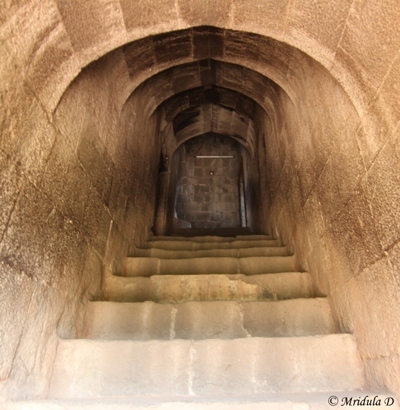 There are steps to climb to go to the top of the building at the entrance. I could see no means by which it would be accessible to a person on a wheel chair. But then I should not just single out this monument, I guess a large number of them would be inaccessible across India. The stairs are somewhat steep. The stairs lead to a spacious courtyard. It took me some effort to take this picture when I managed to get it sans any human beings! The view to the front are nice. You can see the lawn and the fountains. I am told there is a musical fountain show on the premises but not everyday. From the first floor one can also see towards the city. I wonder what was the amphitheater was being prepared for? The monument is clean and I could see no graffiti or litter. I had a completely relaxed morning with Supriya at Shaniwar Wada in Pune. Remember I was talking about new year resolutions related to food a few days back! Well they took a severe beating on this trip to Pune with Novotel. I will blame that lavish dessert spread for it. 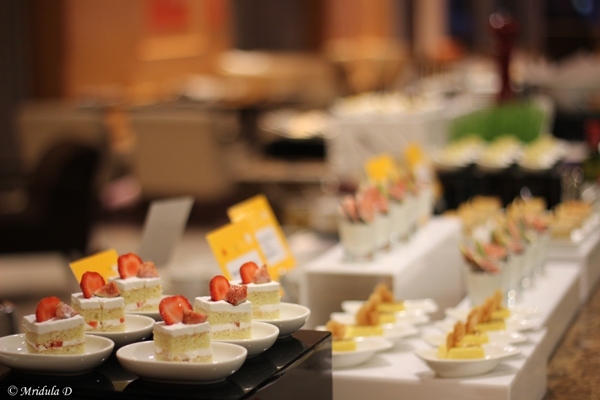 Here is a glimpse of some of the Novotel Pune food. I am sure I have gained 2 kg in two and a half days! 10. As far as you can see in this picture, it is the dessert table. With my sweet tooth how could I resist taking multiple items? OK this spread had one small section of salad and one for behl, but other than that everything was sweet. I never touched the salad but I did enjoy the bhel. 9. 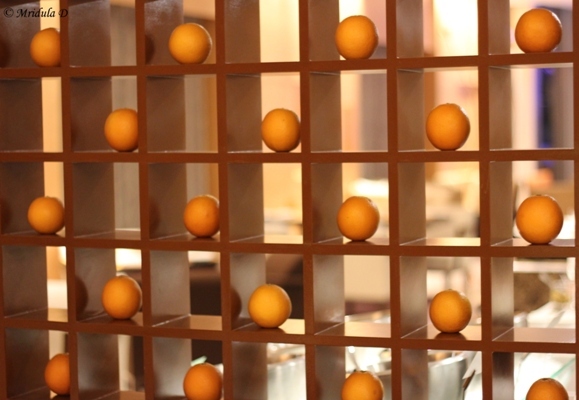 The oranges looked really good as a partition show piece. But on this trip I really did not eat any fruit! Too bad I know. But when I had so many real desserts to choose from, why would I look at fruits? 8. 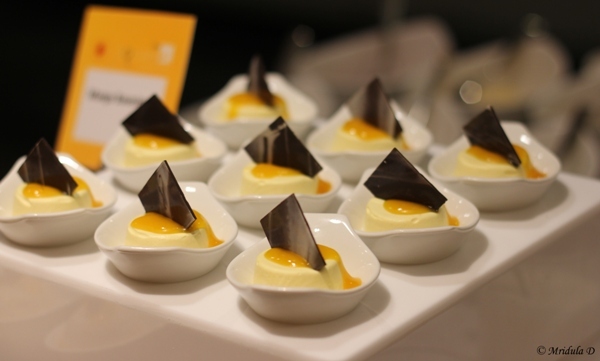 I classify my desserts in two ways, Indian and foreign. I know the names of a few Indian desserts but to me all the foreign ones are cakes and pastries. I know it is bad, more so when the name tags were right next to them! In future, I will click the name tags too so that I can write about them properly. I did not try this one, tempting though it looked. There were way too many to choose from! 7. Red, yellow, green and orange and white, I have to say it was the colors that make me pause. For this pictures, I even removed a name tag to take a better one. 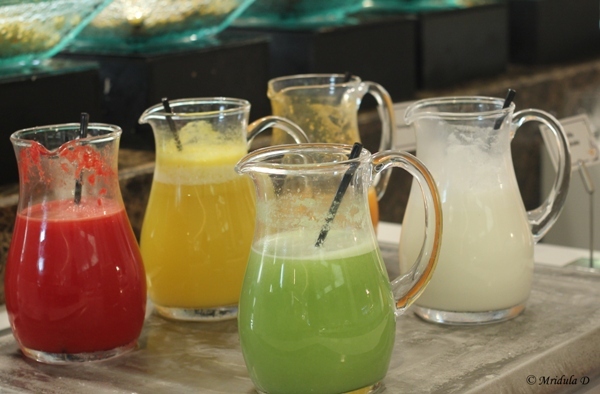 The green one is cucumber juice. 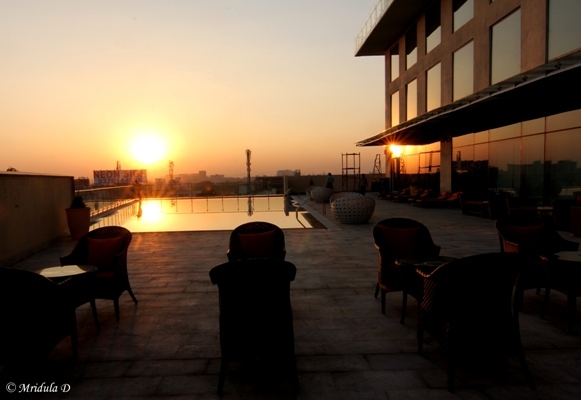 If you find yourself at Novotel, Pune do give it a try. It tasted fresh and good. Remember to stir it well as they added masala to it. 6. 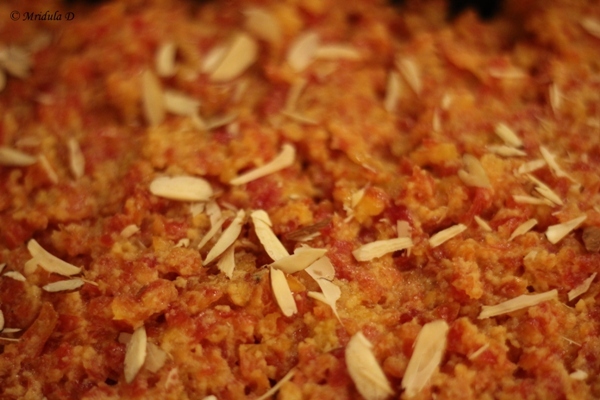 This was my first gajar ka halwa of the season, and any other I eat, will have to be really good. Unless of course my sister makes it! How I miss being active in sports these days. In spite of liking it a lot I restricted myself to small quantities. 5. I have lived in hostels for close to 11 years. And at one place where I spent 5 years, the daily breakfast was sliced bread. I started to hate bread with all my might. 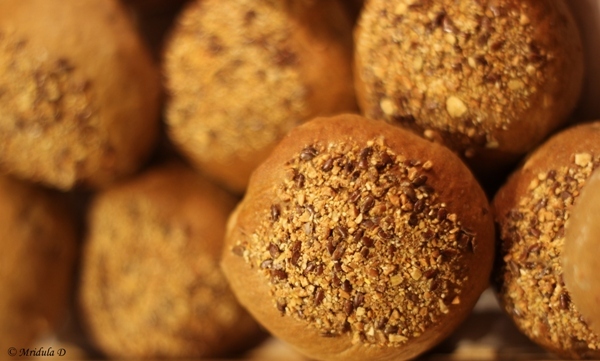 When I said this early on, someone told me I have not discovered real bread. I turned my nose and walked off! But now I know they were right, I really liked their spicy bread which had olive in it. 4. 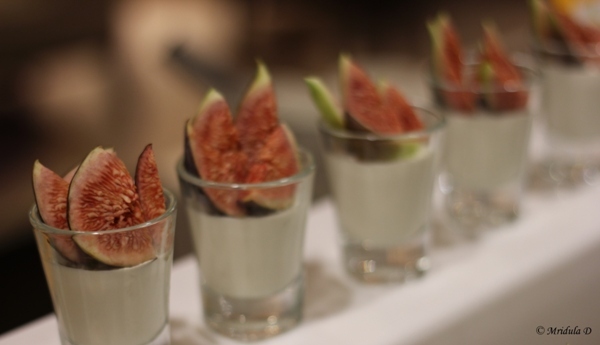 For every buffet meal Novotel Pune does a sugar free dessert. Of course I would pick it up but along with 2 to 3 full of sugar desserts. I am not a big fan of sugar free but these were seriously good! 3. 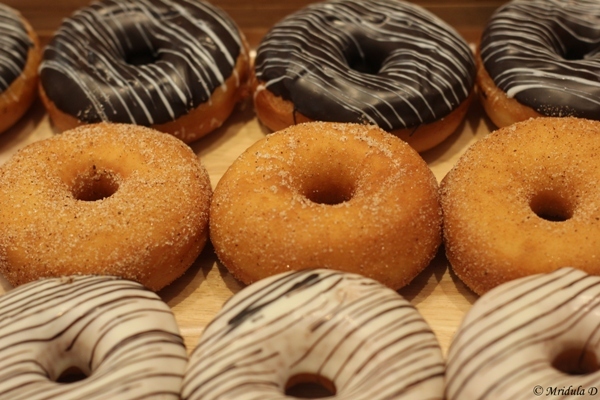 These doughnuts are from the breakfast table. For once, I clicked them because they make for a good picture but I did not eat them. I have got nothing against doughnuts, it was just that there were many other things that came up higher in my priority list. 2. Novotel, Pune had a decent South Indian section for breakfast and that is where most of my stuff came from, vads, idilis and doasa! 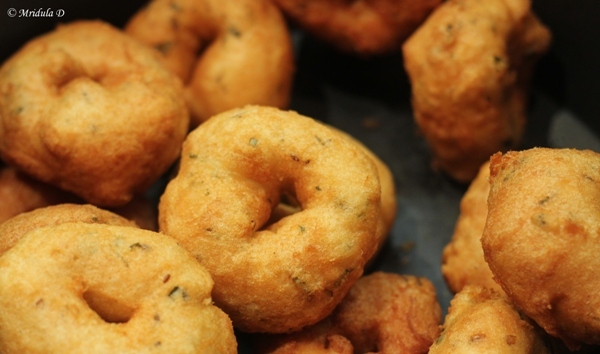 And guess what other than the chutney they also had scrunchy milagai podi. 1. 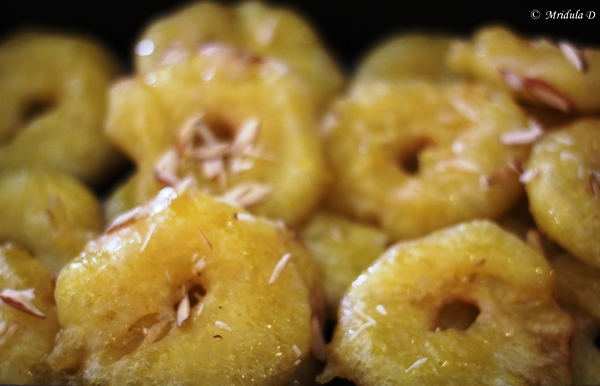 I am one of those people who like pineapple to be pineapple and jalebi to be jalebi. I am fond of both actually. When I saw the fusion I was intrigued as well as a bit skeptical. But once I had it I was completely bowled over, so much so that it is my number 1 pick from the lot. I still regret that I had only one! Next time when ever I encounter them again, I will set the record right! For this Sky Watch I bring forth a few new things. I learned how to create the sun flares at will. In the past I would mange them accidentally but not anymore thank to a Digital Photography School article on sun flares! However, there is one common thread, and that is Pune Skies. The second new thing is that this is my first time in Pune. Even though it was a short trip, I managed to venture out into the city. 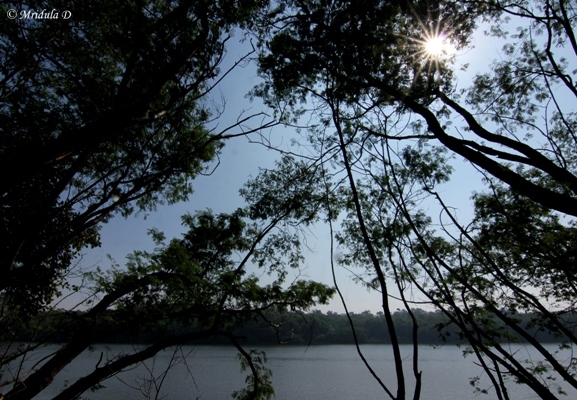 I took a brief peak at the Rajiv Gandhi Zoological Park and discovered this magnificent lake Katraj in its backyard! The trees gave me a perfect opportunity to create a sun flare. There is an awesome collection of snakes in the park but I say, there is no substitute for spotting animals in the wild. I was in Pune at Novotel Pune’s invitation. And I am so happy that the leave gods worked in my favor this time. Here, I have been eating desserts like there is no tomorrow. That necessitated a trip to the swimming pool. I went there when the sun was high. Friends on Twitter asked if I would not find it cold? After Delhi, Pune was not cold at all, not even the swimming pool. While swimming, I realized that the sunset was in that direction! So went back at the sunset too. I am happy I did. And this time no sunrises for me. I am really tired, I am looking forward to getting up late everyday till Sunday. This is one of the rare trips when I get back home on Friday and I do not go to work the very next day! This is a Sky Watch post. And I hope it needs no introduction. If it does just visit the page. I hope you enjoyed my Pune skies.